Mt Bethel United Methodist Church exists for in Matthew’s Gospel, the risen Christ made it clear: “Go therefore and make disciples of all nations, baptizing them in the name of the Father and of the Son and of the Holy Spirit, and teaching them to obey everything that I have commanded you” (Matthew 28:19-20). Mt. Bethel began Sunday, December 12, 1960 as a mission of the Evangelical United Brethren (EUB) Church. Membership and strength was significant in the early years. 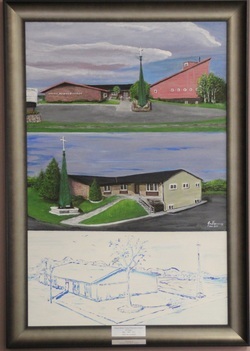 Facility growth of a church addition in 1983, a Sanctuary and basement classrooms were built in 2004. There was consideration of closing the church in the 1990’s. Mt. Bethel Church re-evaluated its mission and ministry plans and moved forward in cultivating vitality in the Church and our Inver Grove Heights community. The Cross and Flame is a registered trademark, and the use is supervised by the General Council on Finance and Administration (GCFA) of the United Methodist Church.